This is one of those stories that'll make you love the world all over again! So last Friday I headed downtown for a girls' night out with some old friends. Lately I have been getting too many transaction fees when using my debit card so I decided to budget how much I was allowed to spend and carry that day in cash only. I got to the bank literally five minutes before they closed and withdrew $250. I have budgeted $50 dollars for the night and the rest was for a bill I needed to pay on Sunday. I zipped up my little black pouch and headed over to my girlfriends house. The club was more fun than I had first expected. The crowd was amped, the drinks were cheap and the music was simply amazing. I was so glad we had planned this night, it was definitely needed. By the end of the night my feet hurt so much from all the dancing so I decided to switch over to some comfy flats I had in my purse. I kept digging in my purse but couldn’t find them so I started to take things out to clear the clutter. I placed my little black pouch on the edge of a small flower garden close by my girlfriend’s condo. Finally I found the flats and was on my way to get some sleep. The next morning, we woke up and reminisced about the night before as we made breakfast. Around noon I said my goodbyes and started digging into my purse once again but this time for my pouch. I kept looking and looking but my pouch was not in my purse. At this point, there’s about a million tears in my eyes, I can’t breathe and I’m thinking of a million things all at once. I had $200 in cash, my IDs, my debit card and not to mention two fully loaded Credit Cards. This was a disaster waiting to happen. I was so convinced my pouch was long gone that I kept rejecting my girlfriend’s suggestion of going to look for it further. How on earth were we going to find a bag full of money in downtown Toronto? There was no doubt in my mind that someone had found it by now. I wasn’t entirely wrong. After an hour of crying, I finally decided it was worth a shot. We left the building and started to retrace our steps. Forty-five minutes later, no pouch and more tears, my girlfriend turned to me and said “Oh my God, there it is!”, pointing to the small flower garden by the building. In my bitter mind, I was prepared to see my pouch cut up and hung around a pole in some vicious act…instead, this is what I saw. “YOU’VE GOT TO BE KIDDING ME” were the first words out of my mouth. “No, No, NO!! Call him, HE HAS IT!” my girlfriend screamed with joy. So I took my phone out, still shaking out of bliss, and called Matthew. I loved every word out of his mouth. I was still in complete awe that people like him exist. He told me that he had seen my pouch and felt bad for me after realizing I was a student as well. He said he tried to find me on Facebook at first but when he couldn’t he decided to make a sign in hopes of finding me. I thanked him a million times and we arranged to meet so I could retrieve my pouch. I met Matthew for a few minutes and even though I insisted on a reward, he refused and said it was the right thing to do. I opened my pouch and not even a penny was missing. It’s safe to say, I now have faith in Humanity. The world needs more Matthews. After this experience I’m really interested in knowing how many of you have you ever lost your wallet? 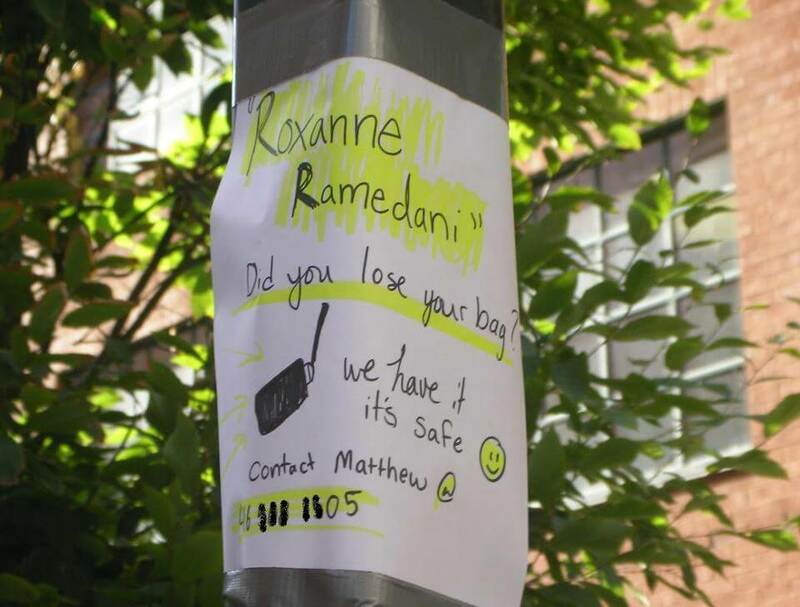 Was it ever returned and would you ever go out of your way to return something you found?